Our Natural Burlap made from Jute fabric. Burlap fabric is commonly used for a wide variety of eco-friendly purposes like for crafts project, making a burlap table runner or burlap tablecloth, rugs and wall coverings and much more. 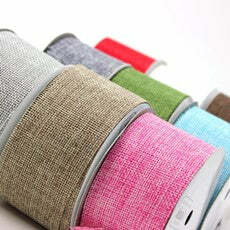 Many of our customers purchase multi colored burlap rolls for their wedding or home design also. They are 100% natural and biodegradable. Though there are some other uses for this fabric that are widely held amongst people who are also not planning for weddings. Individuals who have farmhouses or gardens can also use our products as tree wrap to protect their young plants. At bbcrafts.com, our high-quality jute burlap is available in various colors like black, purple, red, white, natural and much more at the affordable price. Browse through our products and select according to your requirements.